There’s something about an armadillo’s armour that makes me want to get all technicolour with my pens! They also look rather like they’re constructed of mosaic, hence the ceramic-style patterning on some of the scales. I drew this with markers and coloured pencils after seeing some armadillos at Bristol Zoo (background added digitally). 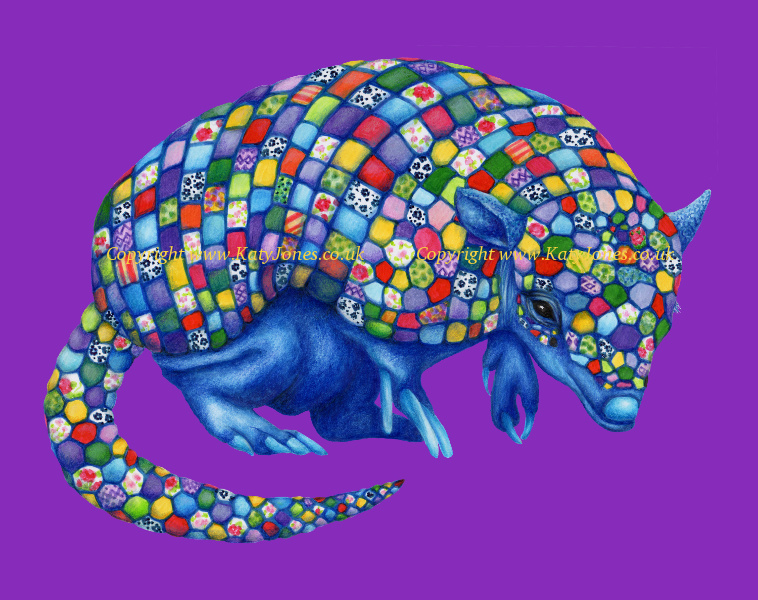 It’s based on my Mum’s photos…although obviously Bristol Zoo’s armadillos aren’t quite this colourful! I wanted this to be a versatile image that could be used on different products. It’s currently available adorning forty-three different items in my Redbubble shop, including T-shirts and other clothing, bags, stationery and homeware.